A new exhibit at Mayo Clinic's Rochester campus traces the history of the collaboration between Dr. Charles Mayo and Marie Curie. 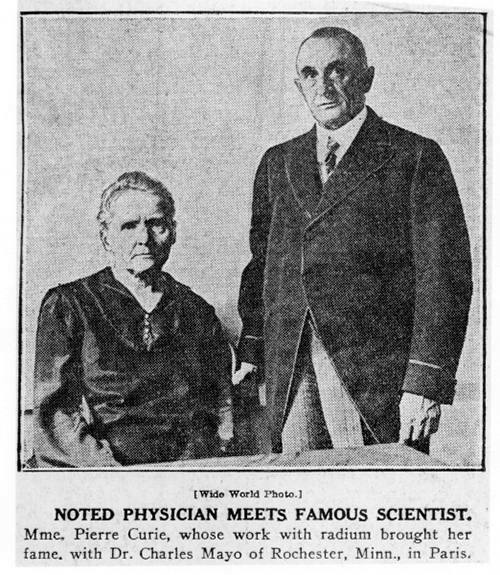 One of the most famous names in science became linked with Mayo Clinic when the Curie Hospital opened in Rochester, Minnesota, in 1920. This was the first of multiple, ongoing associations that included friendship and collaboration, along with facilities, art and displays. The hospital was named in honor of Marie Curie (1867–1934). With her husband and collaborator, Pierre Curie (1859–1906), she shared the 1903 Nobel Prize in physics with physicist Henri Becquerel for the discovery and study of radium. 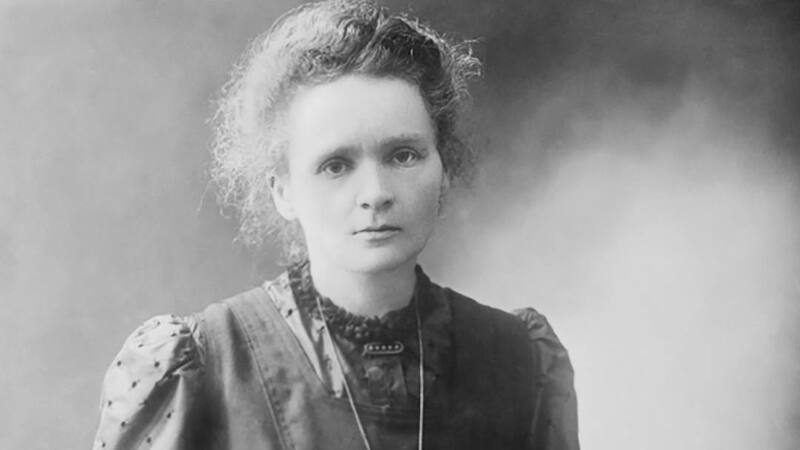 In addition, Marie Curie was the sole recipient of the 1911 Nobel Prize for Chemistry. She is one of four people — and the only woman — to receive more than one Nobel Prize since the awards began in 1901. Located where the Kahler Hotel's Grand Grill restaurant is today, the Curie Hospital had 36 beds for Mayo Clinic patients who needed X-ray or radium treatments. Harry Bowing, M.D., was the medical director. While the growth of Saint Marys Hospital has been well-documented, the Curie Hospital was part of a lesser-known consortium of smaller hospitals located in downtown Rochester. They were clustered near the Mayo brothers' outpatient practice, a red brick structure on the site of today's Siebens Building. After the hospital's opening, Dr. Bowing wrote to Marie Curie requesting an autographed photo, as well as a picture and signature of her late husband. When providing these items, she replied: "I possess very few documents carrying the signature of P. Curie. Indeed, if I am sending you one at all, it is because I have been very touched to learn that your section of radium therapy bears the name of Curie Hospital." Today these artifacts are preserved in the Historical Suite of the W. Bruce Fye Center for the History of Medicine, on the third floor of the Plummer Building at Mayo Clinic's Rochester campus. Charles H. Mayo, M.D., met Marie Curie on two trips to Paris. In 1923, he and Henry Plummer, M.D., presented a paper on goiters and toured hospitals in several European countries. At a dinner following his visit to the Curie Institute, Dr. Mayo learned of Marie Curie's need for spent radium emanation ampules. When Dr. Mayo returned to Rochester, he and Dr. Bowing sent ampules from Mayo Clinic and other centers to aid her work. In 1925, Dr. Mayo led a delegation of more than 100 American physicians from the Inter-State Post-Graduate Medical Assembly, who attended clinical programs in Europe. As president of the organization, he conferred honorary membership upon Marie Curie. Their picture was published in newspapers around the world. "[Dr. Charlie's] collaboration with Marie Curie shows how the international dimension of Mayo Clinic's research has been part of our mission from the beginning." — Stephen Riederer, Ph.D. The Curie Hospital closed in 1962. 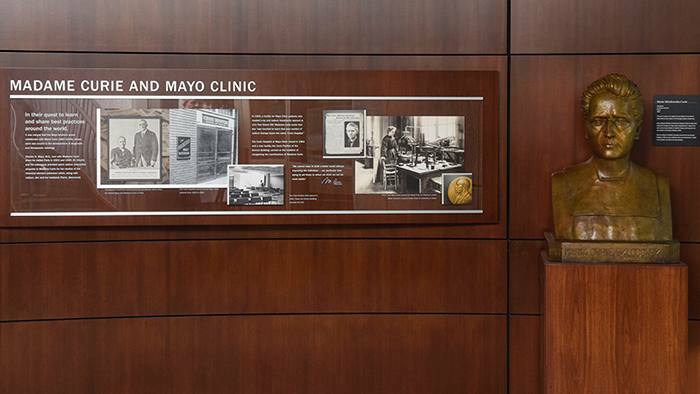 Its functions shifted to the new Curie Pavilion in the subway level of Mayo Clinic's Damon Building — a multiuse facility that included the Mayo Medical Museum and parking. The Damon Building, also called the Damon Parkade, was north of the Mayo Building and west of The Kahler Grand Hotel, on the site where the Gonda Building is today. Around this time, Dr. Mayo's son visited the Oncology Hospital of Mexico City and admired a bronze sculpture of Marie Curie. He made arrangements for Mexican sculptor Abraham Gonzalez to create a replica and donated it for display in the Curie Pavilion. After the Charlton Building opened in 1989, the sculpture was moved to the subway level, near the services of Radiation Oncology. During a subsequent remodeling project, it was removed from public display. This year, the sculpture was installed in a new exhibit about Marie Curie and Dr. Mayo in the lobby of the Opus Building on the Rochester campus. The location is significant, says Stephen Riederer, Ph.D., director of the Center for Advanced Imaging Research. "The Opus Building stands where Dr. Charlie and his wife, Edith, had their family home before moving to Mayowood," Dr. Riederer explains. "Dr. Charlie was one of the first practitioners of X-ray imaging and radiation therapy soon after the discovery of the X-ray in 1895. His collaboration with Marie Curie shows how the international dimension of Mayo Clinic's research has been part of our mission from the beginning." Check out the Bruce Fye Center for the History of Medicine.